In 2016, the Village of Flat Rock received a NCDOT grant to study the concept of creating a system of pedestrian and bicycle greenways throughout the village. The end result (so far) of the work done by Kimley-Horn Consultants, NCDOT, Blue Ridge Bicycle Club, and the village is the Village of Flat Rock Pedestrian and Bicycle Plan, presented in August 2017 in draft form. The village has requested input on the plan from Historic Flat Rock, Inc. and the Cultural Landscape Group:Flat Rock before they send on any changes or recommendations to the consultants for draft revision. Below is our recent response to that request. Plan shows little input from the village community as a whole. Last addressed in the 2004 village survey, the question of whether or not bike/ped paths were desired throughout the village was answered No by a majority of respondents. That survey showed some residents wanted sidewalks in the middle of the village, which have been installed, but not in other locations. With the approval of this bike/ped plan, the village will be making decisions and committing taxpayer money and property with little data as to what residents want. While the greenway locations in the proposed bike/ped plan may have been taken from public comments, those public comments came from approximately 50 people, not all of whom were residents. This is too narrow a sample to use on a project that will permanently alter the character of the village. Until the village conducts a thorough, objective, transparent survey to assess the entire community’s preferences, including any financial commitment, CLG cannot support a bike/ped plan. We consider that the current draft plan is based on the wishes of village council members and a few other residents/business owners/outside interest groups, and does not reflect a village-wide consensus. Plan reflects lack of understanding of the village’s historic character. Preservation of Flat Rock as a small, quiet historic village situated in a wooded scenic landscape blending quality residential homes and open spaces. This bike/ped plan does not reflect that vision. 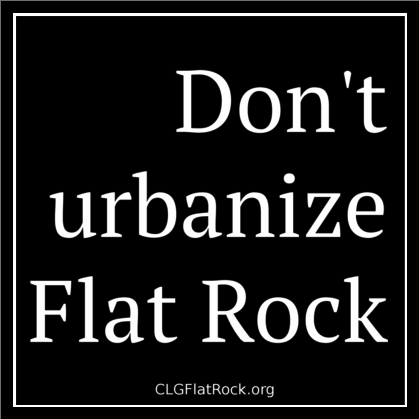 Historic Flat Rock’s comments and recommendations show their concern with this aspect as well. To proceed by approving a bike/ped plan before a professional assessment of the historical nature of Flat Rock’s current landscape configuration has been done risks permanent damage to our historic character. CLG has been talking with those involved in this type of landscape assessment—this is an exciting new facet of village history that is just beginning to be identified and can be easily lost. Plan document is superficial in scope. We are disappointed in the generic, off-the-shelf treatment presented in the plan document. There seems to be little original content or apparent understanding of the community as a whole. For instance, Flat Rock’s demographics as shown in the plan reflect our older, retired population (with only 36% of our population participating in the workforce), yet the plan emphasizes the benefit of greenways for commuting. The economic focus on tourism promotion ignores our already existing robust tourist economy and puts the burden on village residents to deal with increased traffic and increased costs. Village residents deserve the opportunity to decide whether or not Flat Rock wants to be primarily a tourist destination or a rural residential community. Plan is based on the taking of private property for a nonessential project. The development of a bike/ped greenway system is not a necessity. To build out the bike/ped plan as proposed involves extensive taking of private property throughout the village for a nonessential project, which is of great concern to us at CLG. While this council has said they do not plan to use eminent domain to affect property acquisition, that decision is not binding on this or future councils, and the village council in the past has voted to use eminent domain. It is a serious matter when a local government uses the power of the state to take someone’s private property for a nonessential use. Given our grave concerns about the proposed Village of Flat Rock Pedestrian and Bicycle Plan and its implementation, the Cultural Landscape Group:Flat Rock cannot support the development of a village-wide bike/ped system based on this document. We hope the Flat Rock village council will seriously consider the potential damage this plan may do to Flat Rock’s unique historic character.